Hanoi (VNA) - Domestic and international experts in the sugarcane industry gathered at the fifth TTC annual international sugarcane conference recently held in Phan Thiet city of Binh Thuan province to discuss ways to help the Vietnamese sugarcane industry develop sustainably. 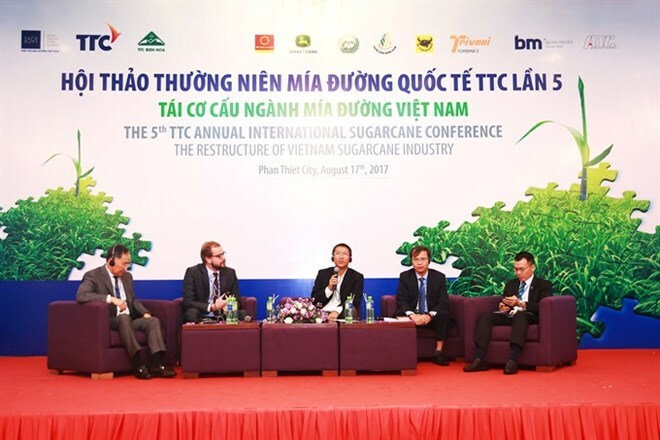 The conference, themed “The restructuring of Vietnam’s sugarcane industry”, was co-organised by the Vietnam Sugarcane and Sugar Association (VSSA) and TTC Group. The country’s sugar output hit nearly 1.2 trillion tonnes in the 2016-17 crop, VSSA reported. This is the third continuous decline in sugar output. Slow market consumption, high inventory, complicated sugar smuggling issues and ASEAN’s imposition of a sugar import tax rate of zero percent after 2018 have created an urgent need for Vietnamese businesses to adapt, and have forced a rethink of the whole country’s sugar industry. As the Ministry of Agriculture and Rural Development implements a policy of restructuring the agricultural sector towards enhancing added value and developing sustainably, sugar companies are constantly innovating to promote internal strength, improving their competitive position domestically and internationally. However, as many difficulties and problems still exist, the Vietnamese sugar industry needs radical solutions to be able to grow. This year’s conference attracted more than 400 guests, including leading domestic experts, policymakers, research institutes, businesses and representative farmers in the field of sugarcane and speakers from the world’s biggest sugar producers such as Brazil, India, China, Thailand, Australia, the US and the Philippines. Domestic speakers provided an overview of policies for the Vietnamese sugarcane industry, its current status and orientations for new sugarcane cultivation in Vietnam by 2020 with a vision to 2030. Meanwhile, international speakers gave presentations and shared experience in product diversification to enhance the value chain of sugar; steam saving in sugar mills and applications of optical sensor technology in a sugar production system in Louisiana. Apart from the goal of forging international links in order to promote the growth of the Vietnamese sugar industry as in previous seminars, this year’s international conference was an opportunity for enterprises to exchange and share experience, while seeking cooperation and investment opportunities. It was also a chance for businesses to propose effective production plans, as well as support sugarcane farmers in approaching advanced information and technology from around the world. Within the framework of the August 17-18 conference, the TTC Group signed a memorandum of understanding with two prestigious international organisations in the sugar industry, Mitr Phol Group (Thailand) and Vasantdada Sugar Institute (India). Under the agreement, TTC and Mitr Phol Group will jointly support research and development (R&D) activities of both parties, including the exchange of R&D courses for students and staff; exchange of R&D staff, research for annual cooperation programmes on sugar products; and organisation of long- and short-term training courses depending on needs and the number of applications approved by the two parties. Mitr Phol has committed to working with TTC to hold annual conferences and other training activities as well as share experiences and introduce TTC to other prestigious units in Thailand. In another agreement, the Vasantdada Sugar Institute will provide consultancy in R&D and technical methods for TTC sugar labs, and will train staff in Vietnam and India. TTC will sponsor related costs including travel expenses for scientists, and provide staff and related documentation for projects. With more than 70 years of development history, Mitr Phol is Asia’s biggest sugar producer and fourth in the world, owning many factories in Thailand.